"Revolutionary", "fat burner", "rapid weight loss": these are just a few of the descriptive words used for the Slim Quick Diet Pill. Does it work? Is it safe? Should you try it? Read on to find out if this popular pill is right for you. 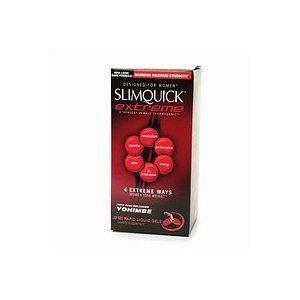 What is Slim Quick Diet Pill? The Cyclovite blend stimulates fat loss while supporting overall health and wellness of the body. The Nutratherm formula controls thermogenic function, thus raising metabolic rate. The Estrotrim compounds are clearly associated with the hormonal health of women. The ingredients are put together to provide optimal support of hormone balance, including losing weight, reducing body fat storage, alleviating premenstrual symptoms, and controlling appetite. The Cortifem concoction targets stress-related hormones. By adding this blend, stress hormones are lowered, some of which are reported to be responsible for weight gain and muscle loss in women. The Aquaplex formula contains herbs with diuretic properties. These herbs are well-known for their ability to release fluid from the tissues of the body. The Xtend complex in each capsule is a time-released formula that elevated metabolic rate throughout the day. It also is reported to increase the absorption of the five other Slim Quick complexes. Diet and exercise are mentioned as components to the Slim Quick program. The diet recommendation is for a low fat, reduced calorie intake and a free diet plan accompanies each bottle of SlimQuick pills purchased. The exercise regimen consists of two levels. Level one is geared toward the non-exerciser. It is a week-long plan that engages every muscle group once during the week. Level two is recommended to follow level one, or be used by individuals who are already physically fit. It is an outline of "pre-exhaust, supersets" exercises geared toward fat loss. For the first week, one capsule is taken before breakfast with 8 ounces of water and on an empty stomach. A second pill is to follow exactly six hours later, again with 8 ounces of water and on an empty stomach. After the first week, two capsules are taken at before breakfast and six hours later in the same manner. To benefit from the diet pills completely, the diet and exercise plans are encouraged to be followed. The pills are directed to be taken for at least one month. Cost varies between $25.00 and $35.00 for a one-month supply. The results of Slim Quick Diet Pills vary. Some reports claim that tremendous weight loss was the result, with 10 pounds in one week. Other reports state that a more modest rate of loss was experienced, about 8 pounds over the course of the month. And yet, additional claims nix the supplement as working at all. The health warning of the Slim Quick Diet Pill cannot be overstated. While the ingredients are natural versus synthetic equivalents, there is a significant amount of caffeine contained in each capsule. For this reason, even the manufacturer recommends not exceeding four capsules in a 24 hour period. Side effects include nervousness, irritability, insomnia, elevated heart rate, and anxiety. If you are pregnant, nursing, or trying to conceive, you should not take this diet pill. Children should not take these pills. Also, if you taking medications or suffer from any chronic health conditions such as cardiac disease, high cholesterol, diabetes, kidney disease, or liver disease, you should consult with your physician beforehand. As with any diet supplement, it is highly advised that you seek the advice of your physician. Many herbs and herbal supplements can interfere with the action of medications, thus making them ineffective.